Had the chance to compare output from Caanoo and PSP 2000 (same projects, same headphones) - PSP sounds far clearer, Caanoo murky & muddy by comparison. Big enough difference to make me switch to PSP. Did anyone maybe try to run piggy on a pocketchip? IMHO, it should run really easilly. install libalsa*, libsdl-1.2*, maybe some other devel and lib. There could be maybe a little work on the "key mapping". Maybe you need to add -fpermissive to the CFLAGS. This source code is really portable, so there is no reason it won't run. Someone offered to buy marc one for a port and then ghosted... should be pretty easy! 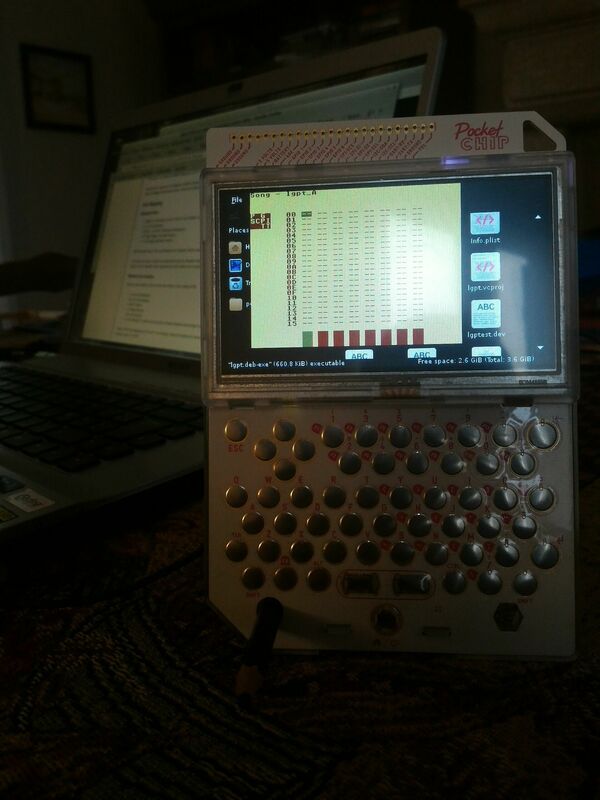 I own a pocketchip, i'll try to build a binary. After git clone, go to the projects directory. Then launch make, you should have a binary. I've looked on github, but with the "lgpt" keyword, not "littlegptracker". I think the homepage should show the link to the source code as well. The size is ok. It would only be better if it was fullscreen (with the same resolution, like for picoloop) but anyway it's good enough like this. Aahhhhhhahahahah. That pic makes me happy. Does full screen work with the config.xml argument? This pocketchip stuff should probably have its own thread, huh?